At a certain age, boys seem to outgrow the fairy realm and girls still love them. 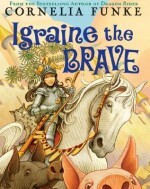 Also these books have girl protagonists. “Lakshmi Auntie drops Sumai off with us a couple of days later, and scurries a protesting Ashwin away for a haircut…The day promises to turn from plain hot to furnace hot.” In this multicultural children’s book set in India, a young girl grapples with the divorce of her parents, and memory loss of a family friend. “I just had to be able to help make mochi! I need to think of a way to convince my parents. Good think I had the perfect thinking spot…” Breaking the gender barrier- again, and this time, against the cultural grain. “If she didn’t try announcing the game, she knew she’d regret it… Everyone wanted to be the announcer. 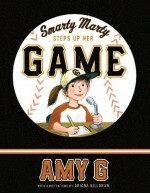 It was one of the most important jobs in baseball.” Gender equality knows no bounds, and Amy G calls on her real-life experience to prove it. 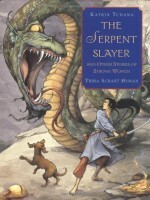 “In the dark time of the year, when the days are short and a cold wind blows from the north, a serpent came to live in an old cave on the mountain of Yung Ling…” From time to time, it’s great to read about a young girl who takes on the challenge of slaying the perennial serpent. This children’s book is a lovely collection of such stories. “I felt like I was speaking a part in some out-of-date play. Who in the world calls their grandmother “Grandmother?” But “Grandma” didn’t seem to fit.” This children’s book is about relationships – between parents, children, grandparents, and friends, showing the way that misunderstandings can create distance, and communication can create love and warmth. 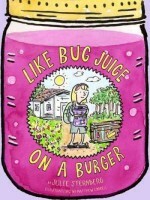 “Did Mom know she hired a witch as a babysitter?” In this second children’s book in the Backyard Witch series, we watch a young girl grow into her own qualities, which are different from her mother’s expectations. “I have escaped! I have achieved the first stage of my emancipation! In a little while I will go on to Baltimore–and from thence I will begin my new life.” This beautifully written historical fiction children’s book is quite hard to put down. “The title ‘Joint Reign’ is a foolishment and emphasizes what I have always contended: that men are more fortunate than women. Joint reign! It is I who inspects, examines, weighs and wrings her brain …” Coming on the heels of an historic election, it is interesting to go back in history and understand more about the obstacles women faced hundreds of years ago. “Leila breathed in the heavy scent of masala, nicked with the sharp undercurrent of gobi and war my oily parathas. She knew most of the dishes on her plate, and was determined to try everything…” The best part of this children’s book is the ending, where the resolution unfolds so skillfully, that only then did I realize the mystery … . “I did not write a long letter to Aunt Veronica. All I did was introduce myself and tell her that the only reason why I had not written before was that my father had never told me of her existence.” The earliest writing of Alexander McCall Smith, this series of mystery books for children is easy to read, silly, and good entertainment. “Mom says she has no intention of ever being a farmer, even though she knows how to drive a tractor and prune grapes.. But if I’m going to live on a farm, I guess I might as well be a farmer…”This is a totally lovable book, and a very likable heroine, who is trying her best to learn all about chickens, one chicken at a time. “Today Bamarre needed a hero more than ever… I was no hero. The dearest wishes of my heart were for safety and tranquility. The world was a perilous place, wrong for the likes of me.” Ogres, dragons, fairies, specters, gryphons, and sorcerers fill the pages of this adventure, dedicated to sisterly love. Sarah looked at Addy. “You is coming to school, ain’t you?” “Momma say I can go,” Addy answered. “That’s good,” said Sarah. “We learn to read and write…You gonna like school. You’ll see.” Written in dialect, an African-American girl’s journey from slavery to freedom unfolds in this series of historical fiction children’s books.